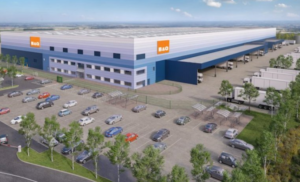 Kingfisher is to install batteries at B&Q’s Swindon distribution centre which will be able to store about 40 per cent of the electricity generated by solar panels on the roof. Solarcentury will manage the installation with batteries supplied by Samsung. Each rack of batteries is the size of a large domestic fridge-freezer with a capacity of 94.5KW, with the total planned capacity equating to 756KW. They can store 40 per cent of the power generated by the Swindon distribution centre’s 552 roof top solar panels. The energy can be released back to the building to provide power during periods of peak pricing. It can also support overnight operations when the solar panels are dormant. Overall, the batteries are expected to reduce the site’s grid power consumption by 31 per cent. The system is to also power electric car charging points in the car park. This project is expected to be completed in early September 2018. “Battery energy storage will help us to better manage the energy we generate on site and will move us even closer to our sustainability goals,” said B&Q chief executive Christian Mazauric. And it “reflects our wider approach to energy strategy to help both our business and our customers improve energy efficiency,” added head of energy and renewables, Jeremy Parsons.